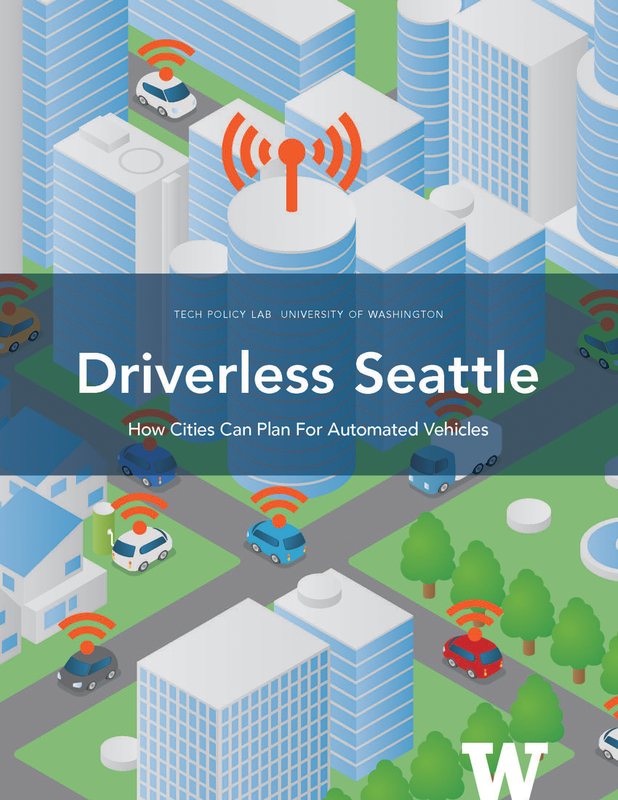 “Driverless Seattle: How Cities Can Plan for Automated Vehicles,” is a new report from the Tech Policy Lab at the University of Washington, put together in partnership with Challenge Seattle, a private sector initiative led by regional CEOs, and the Mobility Innovation Center at the University of Washington. There is no single “self-driving car.” Instead, AVs vary in the extent to which they complement or replace human driving: AVs may automate particular driving functions (e.g., parallel parking), may navigate autonomously only in certain driving scenarios (e.g., on the freeway), or may allow the driver to switch in and out of autonomous mode at will. In some instances, a lead driver may control a platoon of connected vehicles without drivers. We recommend that policymakers recognize the variability in AV technology and employ terms—such as the Society of Automotive Engineer’s six-level AV taxonomy, discussed below—that accurately capture the benefits and constraints of particular AV models. The AV regulatory environment is still developing. AVs are currently legal in Washington state, but AVs could be subject to a variety of new federal and state guidelines and regulations, and municipalities will need to be aware of these developments and the potential preemption of local action. However, municipalities possess their own, varied means by which to channel AVs, including government services powers, proprietary services powers, corporate powers, and police powers. AVs raise legal and policy issues across several domains, including challenges to transportation planning, infrastructure development, municipal budgeting, insurance, and police and emergency services. Some of these challenges result from the extent to which existing laws and policies assume a particular configuration of automotive technology. Regulations that presume a human driver capable of managing the vehicle, for example, may limit the potential benefits of AVs for populations with special mobility constraints (e.g., those with disabilities). Other challenges will likely arise from new policies and procedures developed in response to AVs. For example, methods of revenue generation developed in response to AVs may inequitably shift revenue burdens onto drivers unable to afford an AV. The adoption of AVs is likely to be a gradual and geographically uneven process. While some benefits of AVs are likely to be realized as soon as the vehicles reach the road (e.g., improvements to traffic safety) other potential benefits (e.g., reduced traffic congestion) may not be realized until AVs are dominant on a region’s roadways. Consequently, the transition from traditional vehicles to AVs will likely generate significant, staged policy challenges over time. We recommend that policymakers focus on planning for scenarios that involve both AVs and human-driven vehicles on roadways through at least 2050. AV technologies and policies are likely to have significant impacts on stakeholder groups traditionally underrepresented in the policymaking process (e.g., socioeconomically disadvantaged communities), and will consequently raise challenges for social equity. We recommend that policymakers engage in diverse stakeholder analysis to assess not only the impacts of AVs, but also the impacts of proposed policy responses to AVs.